Written after his not-so-successful first attempt at grand opera Les vêpes siciliennes, Simon Boccanegra still reflects Verdi’s two years in Paris and is one of his darkest operas, with musical characteristics common to the city’s grandest form of art: orchestral colors that have deep hues, long flowing melodic lines that complement an often picturesque orchestral accompaniment, and scintillating ideological and dramatic conflicts that pit loyalties against loves. This is especially true of the version performed at the Royal Opera, which is the revised 1881 version with the electrifying Council Chamber scene ending Act I—the one most commonly given today. There was certainly a fair amount of outstanding singing but overall not as much as one would’ve expected considering the caliber and reputation of the singers onstage. 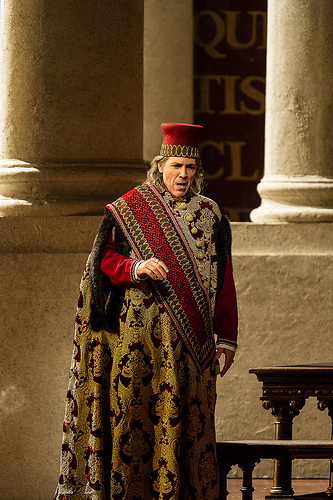 Thomas Hampson was a dramatically convincing and brooding Boccanegra but unfortunately did not convince as strongly with his treatment of the music. Honestly I’m not sure his voice is suited to the role; he had audible strain in the first act but soon eased into the vocal lines with his customary grace and warmth. Of course it isn’t style that’s the issue: Hampson has more style in his pinky than most opera singers can ever dream of; it’s more a matter of expectation and vocal weight. He had beautifully intimate moments with Hilba Gerzmava’s Amelia, especially when, in Act II, he lovingly refers to her for the first time as “mio figlia.” Even stronger was the Council Chamber scene, the only time Hampson really let loose; still, these moments just didn’t affect as one would’ve hoped. Newcomers Gerzmava and American Russell Thomas were almost show stealers—more on that in a moment. Thomas, who made his debut at the Royal Opera, sang an electrifying Adorno: he as a rich and clarion tone that is colored with a deep reddish hue, but moves along the scale vividly and with passion. He recalls a young Domingo, actually. One might have wished that he could have absorbed some of the more mature sytylings of Hampson but that will come with time. As Amelia, Gerzmava has a bell-like sound with a French vibrato that runs through her range. Her “Come in quest’ora bruna” was wonderful, sung with a spinning line full of clear and elegant legato. At times, however, there is inconsistency between registers that creates some doubt as to whether or not she—like Hampson—is really ready for the role. Dimitri Platanias, as Paolo, was every bit as good as when I saw him in Rigoletto last year. His strong yet supple vocal lines are imbued deeply with thrilling color and nuances, which he rounds off with a syrupy sound. But the true show stopper was the third bass-baritone on the stage that evening, Ferrucio Furlanetto, who was at his usual best: singing the smaller and dramatically restricted role of Fiesco didn’t quite suit his fully committed and bold style, but he sang it with the verve and subtlety that comes only with profound experience. Keeping things together was the inexhaustible Antonio Pappano who led the Royal Opera Orchestra through Verdi’s dark and ruminating score with his usual fiery approach. His tempi were well chosen, even in the Council Chamber scene, which some modern conductors simply take too slowly. On the whole this production fell flat dramatically. Thomas and Gerzmava especially simply drifted across the stage, often lacking any real motivation for even doing that. An opera with such compelling dramatic situations (and equally intriguing Machiavellian machinations) demands more of the director than simply fitting his singers into the frame of a painting with an historical context that falls well short of modern dramatic expectations. Simon Boccanegra is an opera that is characterized by scholars—with their clear retrospective hindsight—by one word: revision. Verdi was never truly happy with it and was continually disappointed by its inability to remain in the repertoire even after its second premiere at La Scala in 1881. Perhaps it’s time for Moshinsky (with some help from the Royal Opera) to examine the production with a fine-tooth comb to see what new delights might come of a revision.